This is a nice, smooth, and inexpensive vodka from Moldova that defies its price point of about $10, not bad for a vodka that received a 91 point rating in January from the Beverage Tasting Institute. That is a 1 point improvement from the 90 rating it received in 2011. That rating puts it in the same range with Skyy, Chopin, Svedka and Finlandia, but not of course in the same league according to this writer with the likes of Karlsson and Purity. Now Purity which costs about $40 a bottle, surprisingly got a points total of only 89, so to no surprise, the Exclusiv people are really pumping up that fact on their website. However, judges at competitions can always be horribly wrong, and if anybody reading this saw some of the judging at the just concluded Olympic boxing tournament, then you know what I mean. Exclusiv incredibly also received a double gold medal at the prestigious San Francisco Spirits Competition in March this year, an impressive achievement for a budget vodka. Few American are likely to have even heard of Moldova, a country located between Romania and the Ukraine, that has been an independent nation since 1991. Before that of course, it was part of the mighty Russian empire. It is a wheat based vodka that has been around since 2003, and although we know it is winter wheat grown near the shores of the Black Sea, distillation notes are non-existent. There is no way that vodka this inexpensive can be distilled more than a couple of times max, so maybe their secret is in the water. The tasting notes from the Institute hinted at almond nougat, sweet cream and minerals with a lively peppery finish. Sounds about right to us. Exclusiv also produces Rose Moscato sparkling red wine, and various other flavored vodkas that may or may not be available at this time like Berry, Coconut, Peach, Citrus, Orange and Raspberry. The reason I say that is that the website is rather ambiguous about these other releases, and another issue is the difficulty in finding where to purchase Exclusiv by going on the web site. However the Bacon Vodka recipe is well worth checking out. However if you are able to track some down, then the value you will get is unbeatable. 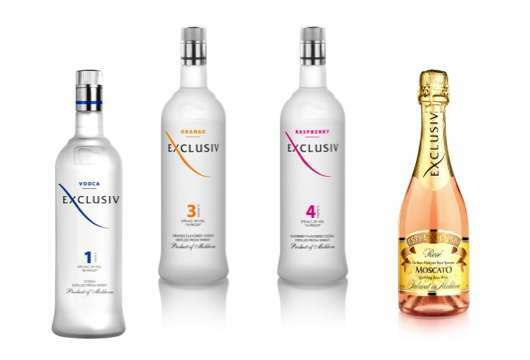 For more information, please visit www.exclusiv-vodka.com.